AFL: History was made in two ways - at least - in a wet and wild AFLW clash on Sunday. Despite terrible conditions at Casey Fields in Melbourne's southeast, a crowd of 6500 witnessed the Brisbane Lions' 4.1 (25) to 1.4 (10) upset win over Melbourne. Given the Demons' status in recent women's footy history and the Lions' base of talent in Queensland arguably being weaker than Melbourne's in Victoria, it was the visitors who ran out 15-point winners. The healthy crowd also pushed the league over 50,000 fans in attendance for Round 1 - a remarkable number for the emerging league. Lightning forced play to be halted during the clash. Heavy rain gave way to thunder and lightning near the end of the second quarter, with officials ordering players off the ground for their safety. An early half-time was called with three-and-a-half minutes left on the clock and the Demons up 1.4 (10) to 1.0 (6). The lightning soon dissipated and the teams played out the time remaining from the second quarter before switching ends for the third stanza. Had the game been abandoned, it would have been deemed a draw under AFL rules because play was stopped before half-time. The Lions seemed to benefit from the break, with Sabrina Frederick-Traub snapping a brilliant goal in traffic to put the Lions ahead. With heavy rain starting to fall after just five minutes of play, it was little surprise the game was a scrapfest. The Demons had a blustery wind in their favour in the first quarter but failed to convert their opportunities. 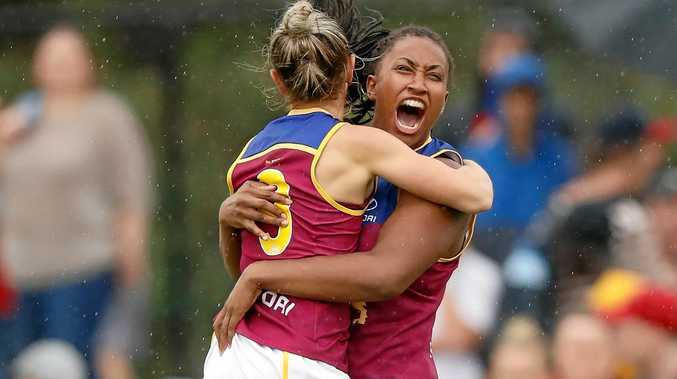 Brisbane soon took control of the game, holding the Demons goalless during the second half and booting two fourth-quarter majors to seal the win. "We just had to ride it out as if it was a normal half-time," Lions coach Craig Starcevich said. "I think they're ready for any challenge. They're a really spirited group and they don't mind an obstacle or two." Melbourne coach Mick Stinear said his side struggled to adapt to the conditions and didn't make the best of their early momentum. "We probably took a little too long to adjust," he said. "There were opportunities to get forward and put the other team under pressure and we kept looking for that extra handball." Lions onballer Emily Bates (11 disposals, eight tackles) stood out at the stoppages, Samantha Virgo marshalled the play from the backline and Frederick- Traub was a constant threat. Demons forward Richelle Cranston is likely to face scrutiny for a high bump after barrelling into Lions midfielder Jamie Stanton during the first term. Stanton left the field with a shoulder injury but returned to play out the game.